BLUE SPRINGS, MO. — Blue Springs police confirmed Sunday that three teenagers were killed in a weekend crash . Officers were dispatched to the area of Indian Hills Drive and Duncan Road shortly after 8 p.m. Saturday to investigate a two-vehicle crash. Three people in one of the vehicles, which BSPD said were a 15-year-old male and two 16-year-old males, were pronounced dead at the scene. The sole occupant of the second vehicle was treated and released with no significant injuries at a local hospital. “Our hearts and prayers go out to all the families involved,” BSPD said in a statement. The cause of the crash remains under investigation and more information will be released when available. "We lost three young men tonight and people all across this community are grieving because of it," said David Maxon, a former football coach to one of the victims. 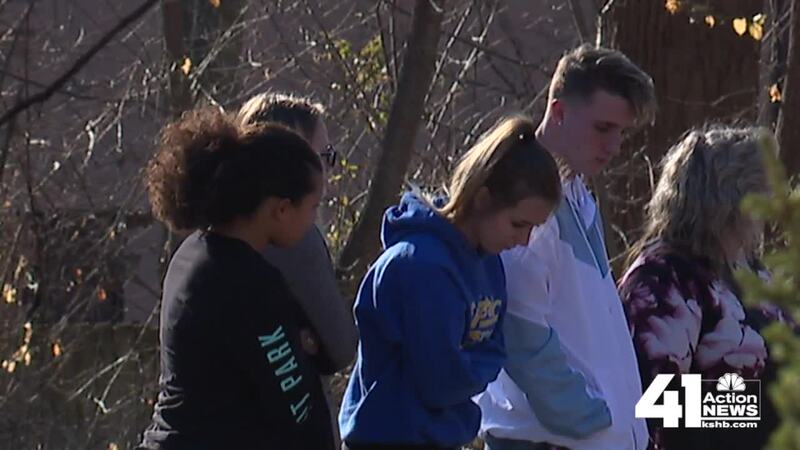 Groups of friends and classmates gathered near the crash site Sunday to create a makeshift memorial. Many placed flowers and balloons in remembrance of the teens. "I could not believe it," one friend, Jonathan Mullins, said. "It still does not seem real right now." A vigil and balloon release is planned for 5 p.m. Monday on the soccer fields at the Blue Springs Freshman Center. Although not identified by police, 41 Action News has learned Darrian Warmack, 16, is one of the three victims. Warmack is the younger brother of Kansas State University running backs, Dalvin and Michael Warmack. Dalvin is the only two-time Simone Award winner as the top high school football player in Kansas City in the awards 35-year history. He appeared in 37 games for K-State during the last four season, totaling 833 yards and four touchdowns from scrimmage.